Raul and Perkins of A Runner’s Circle in Manila asked me to watch the movie on DVD entitled “Running America”, when I visited the store before the Mayon 360 50-Mile Run. They lend to me the DVD of the said film and returned it after I saw the entire film. The film “Running America” is about the documentation of the Trans-Continental Run Across the United States of America by two famous ultramarathon runners, Charlie Engle and Marshall Ulrich, which was held sometime before the US Presidential Election in 2008 with Marshall Ulrich finishing the run by himself. What impressed me about the film is the portion where Marshall Ulrich was gracefully using the use of trekking poles while he was running. Actually, it was my first time to see a runner using the trekking poles while he is in the act of running on a paved road. I usually see the use of such poles when I watch downhill slalom, biathlon and other cross-country ski sports events on the TV. Lately, I saw some runners at the UTMB (Mont Blanc Ultra Marathon) using such trekking poles as part of their equipment to finish the race. Films on UTMB with runners using and carrying trekking poles could be seen at You Tube. In the Philippines, I saw only two (2) ultra runners who had been using these trekking poles on a trail run. The first one was Doc Punzalan of Pinoy Ultra Runners (PUR) in 2008 when I joined his group for my first trail run to Mount Pinatubo. The second guy whom I observed to be using these poles was Jerome Cartailler during my second run to the same area, Mt Pinatubo in July 2010. I saw these guys how they used such trekking poles while they brisked/power walked along the rocky portions of the trail and when they balanced themselves in crossing the river and other water crossings. I was not surprised that these good ultra runners had the appreciation to use these poles. Doc Punzalan had experienced running the UTMB and Jerome is from France, one the countries where the UTMB course would pass. After those observations (years ago), I’ve tried to look for those trekking poles in the local market and it was at ROX where I found a pair that costs about P 6,000 (?). I was surprised to see the price and opted just to hold them. And I forgot all those trekking poles! I know that most of the Pinoy mountain trekkers/hikers know the value of these poles and to some of the TNF 100 trail run participants. However, I have yet to see one of them using these trekking poles in action. But, running with trekking poles on paved roads? It is something that is unthinkable and out of the norm. But I was intrigued when I saw that part of the film where Marshall Ulrich was using these poles on the paved roads across America. So, I made some research on the Internet. 1. Nordic walking which was known before as “ski walking” using ski poles was a good off-season workout for elite Finland/Scandinavian ski athletes to maintain their consistency in their sports. Ski coaches concluded that the use of trekking/ski poles during summer contributed to the success of world-class ski athletes. Ski athletes would train the whole year round using the trekking poles. 2. The use of trekking poles on power walking or running would lessen the impact of the feet on the ground as the weight of the body would be supported by the trekking poles. This form of running/walking is suggested as cross-training for those athletes who are recovering from knee injury or those who are under leg-injury rehabilitation. 3. There are lots of instructional films on the Internet/You Tube on Nordic Walking/Running. All you have to do is google the word “Nordic Walking”. 4. There are a Sports Federations for Nordic Walking in the United States and other European countries which had been in existence for the past 10-14 years. 5. There is a Marathon (42K) Race on Nordic Walking at the Portland Marathon which is on its 5th edition this year. Rules and Regulations are posted in their website. 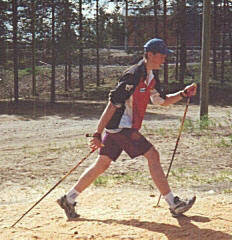 In Europe, there are already existing Nordic Walking Championship Events. 7. Almost all the ultra trail races in Europe allow the use of trekking poles. In the most prestigious UMTB, most of the runners have in their packs a pair of folded trekking poles. 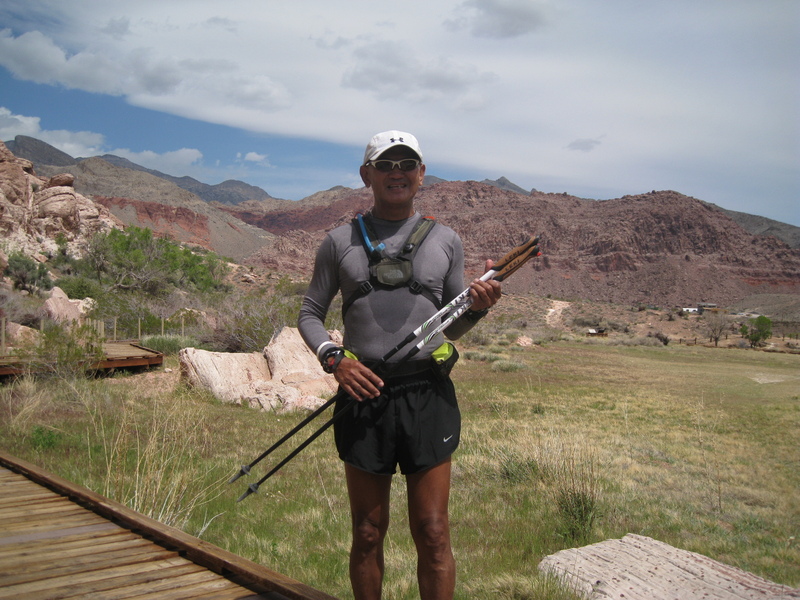 For the past two weeks, I’ve been using a pair of LEKI Titanium Trekking Poles during my regular power walking and I even went to the extent of running with them for 3 hours along the rocky Calico Hills Trail of the Red Rock Canyon Park in Las Vegas, Nevada. 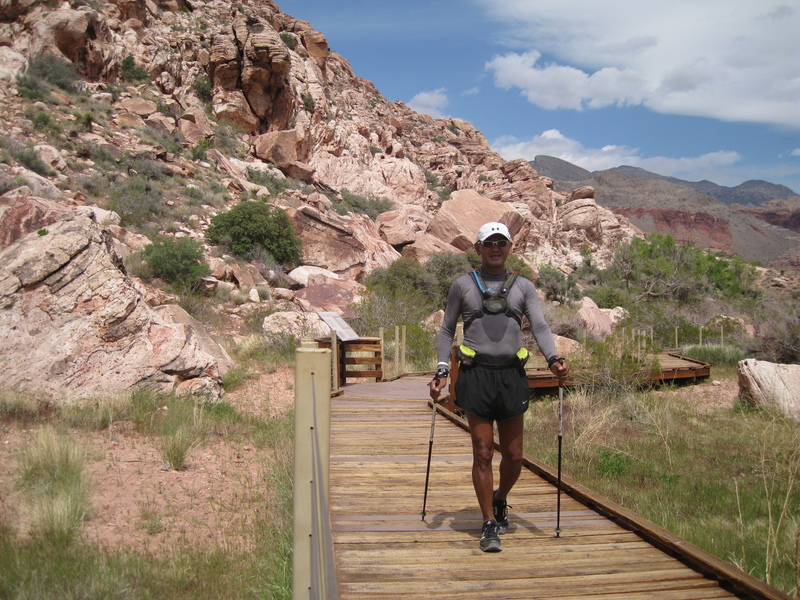 Running and/or walking with trekking poles is a great cross-training activity for me as an old and under rehab average competitive runner. With my present exposure and training with the trekking poles, I am thinking of allowing their use in the incoming PAU’s Pinatubo 100 to all the participants. I will be glad to know about your comments on this. I won a Leki trek poles in a raffle after the Jay Peak Challenge marathon in Vermont. I tried it on several training runs. IMO, it’s good for stability specially on uneven surfaces like rivers, new trails, slopes and when you’re very tired. It slowed me down on flat surfaces. The tips worn out faster on cement. My wife is using it to ease her back pain. It also develop her upper body particularly her arms. Sir J, it will be beneficial in your recovery since you don’t want to stop running. hehehe. sir jovie, does this mean you will allow trekking poles during the 2012 BDM? 🙂 just asking. God bless you sir and praying for your speedy recovery. where can we buy this in the philippines? you can go to some of the outdoor stores (mountaineering) in our malls and they have hiking poles for sale.